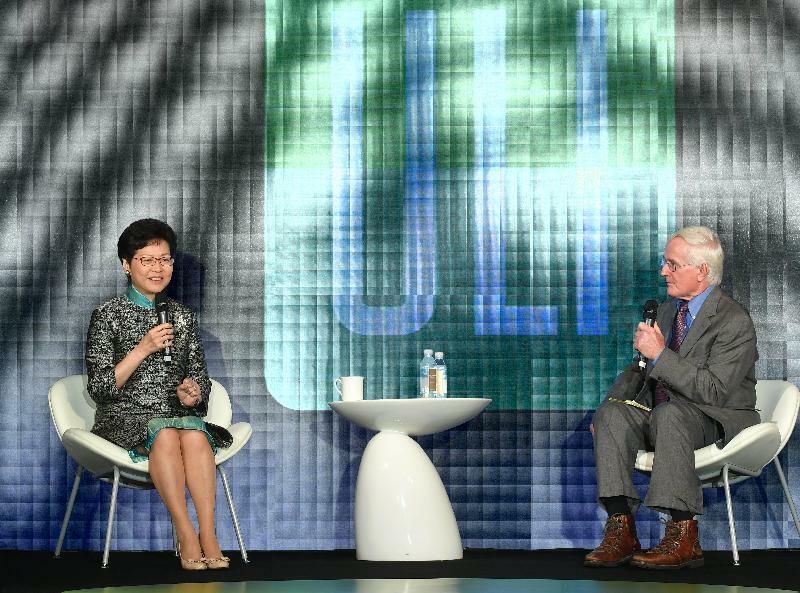 Thank you very much for inviting me to this very important occasion of ULI Asia Pacific - hosting for a second time this very interesting and exciting summit in Hong Kong, especially at the time when you are celebrating your 10th anniversary. I still remember when Nick sent an invitation, he started by saying that this summit is a long way away, because the invitation was actually sent to me last September - it was a couple of months after I took office as the Chief Executive for Hong Kong. But now here I am. So I have this impression that time really flies for me as the Chief Executive for Hong Kong. I'll be celebrating my first anniversary very soon. There is a Chinese saying that when people are in a state of anxiety, very unhappy, then days pass like years (度日如年). So I take it that I have a pretty enjoyable and relaxing tenure as the Chief Executive when months actually pass like days. I think people in the real estate sector are very used to hearing me talk with a beautiful PowerPoint, going into tens and tens of slides about Hong Kong's land development, transport infrastructure, etc. But I have no PowerPoint for you this morning because I was invited to talk about how I lead this top-tier city. There is another Chinese saying that it's easier actually to start a business but it's extremely difficult to sustain a successful business (創業難，守業更難). So I'm now right in this position of sustaining this top-tier city and bringing this top-tier city to newer heights. So I only have a few words that I want to share with you in this leadership position, that is what it's like to lead this top-tier city. One is it is extremely tiring. Secondly, it is extremely challenging, but fortunately it's extremely fulfilling. Now, just to impress upon you the workload or the work pressure on the Chief Executive of the Hong Kong Special Administrative Region, since I won the election on the 26th of March last year, which by now is almost one and a half years, I have only taken one day's leave - to spend a very brief holiday with my family in a city called Guilin in the Guangxi Autonomous Region. And that was really a brief holiday of four nights. But even during that very brief holiday, I had to produce a video on how wonderful it is to travel on the high-speed rail from Shenzhen North station for three hours to Guilin and sort of promoting the high-speed rail in Hong Kong which will open by the end of September this year, and by which time I don't need to go to Shenzhen North to change into a high-speed train. I will walk into the West Kowloon terminus and then one stop - although we will stop en route, but I don't need to change any train - and I'll be in Guilin in about three hours' time. Now, also during that very brief holiday I had meetings with the leaders of Guangxi who wanted to talk to me about this exciting project of the southern corridor. And then I was invited to inspect some poverty alleviation work in a village in Guilin - how they revitalised a village in order to help raise the standard of living in some of these rural villages. So I've come to the conclusion that in this particular position there is simply no private life for the Chief Executive and I just don't have any personal time for myself and my family. That is because about 20 per cent of my time was actually spent outside of Hong Kong in the last year or so. I have made 21 trips out of Hong Kong to promote this top-tier city, and next Wednesday I'm embarking on a grand European tour of 13 days covering three countries and six cities in continental Europe to continue to promote Hong Kong and to explore opportunities for collaboration with Hong Kong in a wide range of areas, including innovation and technology, arts and culture, business, financial services, Renminbi trading and so on and so on, because we are a cosmopolitan city, very proud of being an international financial centre, shipping and logistics, and now emerging as a very important arts and cultural hub. I hope friends who come from abroad will have some time to visit the recently opened Central Police Station Compound, now called Tai Kwun, which is revitalised into an arts and entertainment precinct for Hong Kong people as well as for tourists. I also promised and have delivered this pledge to work more closely with our politicians - the Legislative Council (LegCo) - because in our political system, and that is why leadership is so important, if we want to deliver for Hong Kong, I have to work with the politicians across the spectrum, whether they are pro-government, anti-establishment or even very radical members in the Legislative Council. So from January this year, I started the practice of going more frequently to the Legislative Council to attend not only the long versions of question-and-answers by the Chief Executive every quarter but also in addition to go there at least once a month to be questioned. But these interactions have been proven to be quite rewarding and effective. For those in the audience who are in the construction industry, you will be pleased to hear that I am expecting a very good year in terms of getting funding for Hong Kong's infrastructure. I have said in public that I am expecting total funding to be approved this year by the Legislative Council will be in the region of HK$170 billion, which is the highest level in the last five years. That's so much about this being a very tiring job because of all the things I need to do and the people I need to engage in order to continue to lead Hong Kong effectively. I said this job is also extremely challenging because on the one hand, Hong Kong has her unique strengths which I still feel there is a huge potential to be tapped, and that's why I do a lot of all these overseas and Mainland trips. On the other hand, we are facing a lot of difficulties, so that is what makes this job extremely challenging and also interesting. But let me just start by sharing a bit with you the major challenge lies in the constitutional position of the Chief Executive. Many of you will know that I have been the Government's number two for four and a half years before I resigned to contest in the Chief Executive election. So you will feel that perhaps it's not too different and difficult because it's number two moving into number one position. But constitutionally, as laid down in the Basic Law, the position of the Chief Executive is unique. He or she is responsible to both the people of Hong Kong as well as the Central People's Government, or what we call the dual accountability. So to ensure the continued success of "one country, two systems", the Chief Executive has to perform his or her role well in taking into account the interests of the Central People's Government as well as the people of Hong Kong. I would say with my year of experience that, at most of the time, the two sets of interests align very well, because you have heard our leaders saying that they want Hong Kong to succeed. They want Hong Kong to continue to be an international city and financial centre. And more recently, in the 19th Congress report of President Xi Jinping, he said that he would support Hong Kong to integrate herself into the national development. So there are plenty of opportunities for us to tap, provided that the Chief Executive performs well in discharging her dual responsibility. The second challenge lies in our political system. Tom has been a politician, and many of you know that in many of the overseas parliaments, the ruling government would be having a majority in the parliament, so that the government could push the policy through the legislative council or the parliament. But in our case, our situation is unique in a sense that the Government does not even have a single vote in the Legislative Council. Amongst the LegCo members we could say that some political parties are more pro-establishment, others may be less pro-establishment. But their vested interests differ significantly. So it is not always reliable to think that I have always the support of the allies from the pro-establishment group. It really depends on the issues of the day that we need to press ahead in order to deliver for the people of Hong Kong. The third challenge lies in - there had been quite a bit of misunderstanding or prejudiced comments about where Hong Kong is under "one country, two systems", so especially for overseas friends I would encourage you to really look deeper into Hong Kong's situation and read more broadly about different commentaries about Hong Kong instead of just taking on face value that this high degree of autonomy has been eroded, how the "one country, two systems" concept is not being upheld and so on. But of course it lies on the shoulders of the Chief Executive to continue to dispel those misperceptions and misunderstanding. Hong Kong is facing a lot of challenges. If we want to continue to be a top-tier city, and even further and better to rise to new height, we need to enhance our competitiveness, because we are living in a globalised economic environment. So we cannot sit back and relax and think that we will succeed by being the freest economy in the world and one of the most competitive economies in the world. Because the world is changing, and other people, other governments and other economies are moving ahead. So we need to seize the many opportunities available to us under the Belt and Road and this Guangdong-Hong Kong-Macao Bay Area. I'm not going into details in these two major national strategies and what they have in offer for Hong Kong because I have looked at your programme - I believe that some of the subsequent panel discussions will cover these two very important areas. And then we have an issue of public aspirations. For many advanced economies all over the world, the people are now more assertive. They really want the government to do more for them. They are unhappy about the gaps in wealth, they are unhappy about not being able to buy a flat, young people are a bit aggrieved about the lack of opportunities in upward mobility and so on. So the challenge lies in how I could effectively respond to the rising public aspirations across the spectrum of the economy, job opportunities, social inclusion, equality and so on. 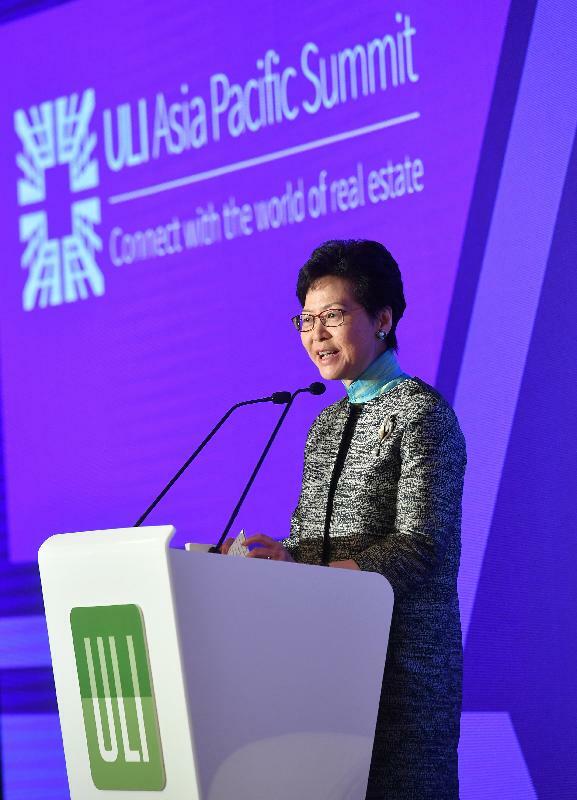 But nothing is more pressing in Hong Kong, nothing is more challenging in Hong Kong, than this single issue of land supply, which ULI may come to our rescue and give us another advisory panel on how we can find the land. Right now, knowing very well that this is a very controversial issue and I have said in public that Hong Kong is not short of land - because only 24 per cent of our 1 100 square kilometres have been developed, so there are still three-quarters of land to be tapped and we are surrounded by water - but there is a lack of consensus on where we should find this land for meeting our economic, social and housing needs. So right now there is a land supply task force undertaking a public engagement hopefully to build a broad consensus before we could move forward. But also on land, I have something very interesting and exciting to report, especially with Tom Murphy here who has helped me, upon my invitation, and did one of those international advisory panels in 2011 on the development of Kai Tak and East Kowloon. Because when I was the Secretary for Development, I did realise that we are not only short of land for housing, we're also short of land for business - especially if we want to be an international business hub, then we need to provide land and offices, especially Grade A offices, for some of these overseas and Mainland businesses to set up. And I have targeted Kowloon East as the second Central Business District. So in 2011, I announced a major initiative called Energizing Kowloon East, that is to transform Kowloon East comprising the two former industrial areas in Kwun Tong and Kowloon Bay and this new recycled site of the former airport of Kai Tak into a second CBD. I said I was excited to report because, Tom, you'll be pleased to hear that within a few years, this second CBD is emerging. We are expecting the Kowloon East to produce about 3 million square metres of office space by the year 2021 - we are gradually building up - and then with the potential to reach 5 million square metres of office space upon completion of the various new developments, redevelopments and conversion of industrial buildings. Looking ahead, if you ask me where could I find a similar area for that sort of exciting development, it has to be Lantau. Because upon completion of the bridge connecting Hong Kong through the Lantau area to Macao and Zhuhai, and the completion of the second link into Lantau Island, that is the Tuen Mun-Chek Lap Kok Link by 2020, Lantau is no longer an isolated island. Lantau is very well connected and very well positioned in the Guangdong-Hong Kong-Macao Bay Area. So I together with my team are now looking into the further potential of Lantau. Inevitably, it will involve some extensive reclamation because people are very attached to country parks and Lantau has two country parks on the south and on the north, and also the southern part of Lantau is simply beautiful with Tai O, Cheung Sha and all these areas, and I don't think we should forgo the opportunities to conserve this very beautiful part of the Lantau Island. My third feeling is this job is extremely fulfilling because I was born and brought up in Hong Kong and I love this city. So where else could I find a job that I could serve the people and serve the people I love than in the position of the Chief Executive? Because as the Chief Executive, I can make decisions. I can make very timely decisions in order to progress Hong Kong ahead. And the very rewarding experience I had in the last year is: once the Government gets its act together, has a very clear vision, clear direction and puts in a bit of resources, the response is overwhelming. This is what I have seen in innovation and technology. Nick Brooke was the former Chairman of the Hong Kong Science and Technology Parks Corporation, laying very good groundwork for innovation and technology development in Hong Kong. The pace of innovation and technology in the last 11 months or so, I have to say, is amazing. So we have an eight-pronged strategy laid out to really develop Hong Kong's innovation and technology, not only to diversify our economy but also to provide more quality jobs for our young people. On the financial side, you will feel that perhaps Hong Kong is already a very mature financial centre, we don't need to do any more things proactively. No. We have introduced a few things in the last several months in Hong Kong to take our financial centre to new height. One is more aggressive policy measures to encourage the issue of bonds, especially green bonds, in Hong Kong. Secondly, is to provide tax incentives for aircraft leasing activities to take place in Hong Kong. Third is the Hong Kong Exchange has introduced new listing rules at the end of April that will attract or facilitate the listing of new economy technology companies as well as biotechnology companies in Hong Kong and provide the more ready platform for secondary listing for some of these tech companies that have been listed elsewhere. So with this very tiring, very challenging and very fulfilling job, I am now very confident and very determined that I will do this job well, because I believe the best of Hong Kong is yet to come. And this is where I will stop and show you a three-minute video on why I feel the best of Hong Kong is yet to come.